According to statistics, Americans owe more on student loans than they do any other type of loan apart from mortgages. Indeed, student loan debt has risen much faster than other forms of debt and today totals almost $1.5 trillion. You might think that you can discharge student loans like you can any other unsecured debt. However, the law drastically limits who can wipe out student loan debt to those who would suffer an “undue hardship” if you were required to continue to pay them back. Whether you will be able to maintain a minimum living standard if you need to repay your loan. The court will look at your income and expenses. Whether your current situation will probably continue for several years or whether you are suffering a temporary setback. The court will look at your health, educational levels, and other factors. Whether you have made a good faith effort to pay back your loans. The court will look at your repayment history. To start the process, you will need to file an adversary proceeding. Your lenders can challenge your request and ask the court not to discharge your student loans. Many indebted borrowers have some success getting some or all of their loans discharged. 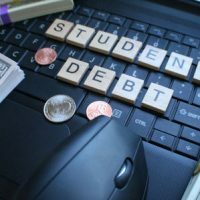 In fact, one study showed that at least 40% of bankruptcy filers who included student loans in their petition were successful at wiping out some of their student loan debt. According to a news story in the Chronicle of Higher Education, the Trump administration is deciding whether change the definition of “undue hardship.” In particular, the Department of Education has put out a request for public comment on how undue hardship should be defined. The Department made no further comment, but the fact that it is seeking input might be a sign that the standard is subject to upcoming change. Extended repayment plans. These will stretch out the amount of time to repay the loan. Although you will pay more over the life of the loan, your monthly bill might be lower. Income-sensitive repayment. With federal loans, you can opt to pay a percentage of your monthly income, usually 4-25%, if your income is sufficiently low. Your lender might allow you to temporarily stop making payments. With a deferment, you do not need to pay interest on your loans. Like a deferment, you can temporarily stop making payment; however, interest continues to accrue. If possible, you can get a loan to pay off your current student loans. If the interest rate is lower on the new loan, you will lower your monthly payment. Talk to a professional if you have questions. If you want to consider bankruptcy, Nowack & Olson in Plantation can help you identify whether you will qualify for an undue hardship exception. Contact us today for a free consultation by calling 866-907-2970.